My name is Alex Dinnin, I work for ITVSport. 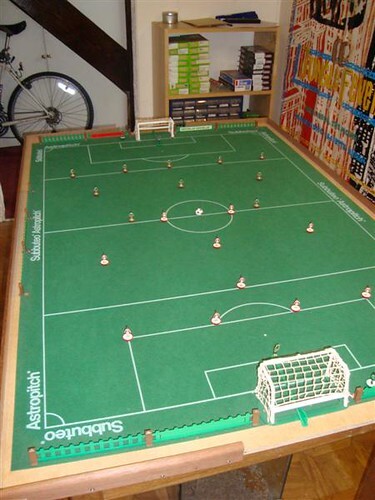 We are looking at doing a little VT piece for the FA Cup Final using a Subbuteo set depicting goals from previous rounds. If you could email me your details and any photos you may have of your setup, I would then get in touch to discuss the idea with you ? You can bugger off if you are going to recreate di Matteo's goal from the 97 cup final. jd1973 wrote: You can bugger off if you are going to recreate di Matteo's goal from the 97 cup final. Alex, I'd be more than happy to help. Will you be smashing a Ref 42 into a Ref 9 to recreate the David Luiz "challenge" on Jake Reeves in the 4th Round Replay? wearebees wrote: Will you be smashing a Ref 42 into a Ref 9 to recreate the David Luiz "challenge" on Jake Reeves in the 4th Round Replay?